As fans of Kinotehnik’s EVF and LCDVF, we wanted to stop by their NAB booth to check out their latest invention: the Practilite 602. We stopped to talk with Kinotehnik’s founder, Tõnis Liivamägi, about the many benefits of the Practilite, including a phone app for remote control, its classic fresnel lens and more. 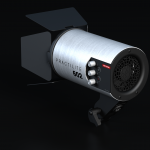 The Practilite 602 is the world’s first and smallest bi-color, variable beam smart LED light. The Practilite 602 comes with an app for smartphones and is Bluetooth capable. This remote function is cost-effective and especially useful for single-person shooters or small crews when a gaffer is not available. 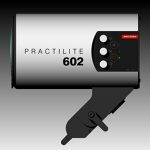 The Practilite 602 makes documentary shooting and field interviews more efficient as managing the lighting setup and adjustments can now be done with greater ease. The classic fresnel lens provides greater light range than conventional LED fixtures. This enables wider shot angles and precise light-shaping without losing the LED output power/throw which is typically the case with barndoor-controlled fixtures. This compact and powerful light is designed to gather and throw as much light as possible through its 3.2″ 80mm fresnel lens, providing you with unprecedented size to light output ratio. In today”tungsten” anymore. Be it CFL, LED, halogen and other types of lighting, our Practilite 602 is just the right tool to adapt to these various lighting conditions. The variable color temperature allows operators to adjust to a variety of color temperatures that each shooting location requires. From tungsten to daylight and any lighting situation in between, you just dial in the matching color balance, tune the brightness and set the beam angle from your smartphone. It’s just that easy with everything at your fingertips. No more lowering the light stands or searching for a ladder, just tune the brightness or beam angle as you adjust it remotely from your smartphone. 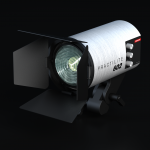 The Practilite 602 is flicker free, which allows for perfectly lit slow motion shots. The 602 is compact and durable. Its aircraft grade, full aluminum construction (CNC machined), allows for safe and easy, cost effective transportation. 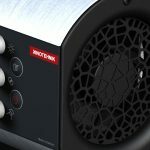 The universal AC/DC power supply is internationally adaptable. The Practilite will be available in July 2015 for about $750. 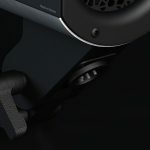 Light & Motion Introduces The Stella Pro RF With Elinchrom Skyport Technology.